My friend, Julie and I just went and tried out a new local tea room. 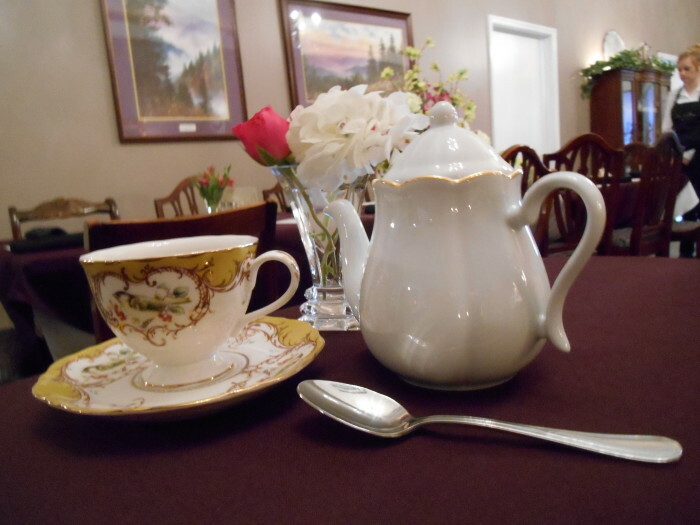 It’s called Tea with Thee by Victoria at 181 Hughes Road, Madison AL 35758 next to Hartlex Antiques. There is a shop/dining room in the front with the main dining room in the back that’s big enough to hold large groups. They serve delicious sandwiches, soups and salads or you can order the three-tier service ahead for something extra special. The chicken velvet soup was yummy. If you’re not sure about a tea (they have lots to choose from – see them on the wall up front) they will let you sample if they have it brewing. Plus they have free refills on their teapots which I very much appreciated. We had the Victoria’s Special Tea and liked it. Good, attentive service. Looking forward to going again soon! See http://teawiththee.com/ for details. I also bought some Caramel Apple and some Blueberry loose leaf tea to take home and try. I liked the Caramel Apple best and didn’t think I would. It wasn’t an overpowering caramel taste with just a hint of sweetness and rather smooth. The owner was very helpful and patient while I looked over some of the available teas. There’s quite a few to choose from so I’ll just have to go back to see the rest.